Where Do I Hang the Compliance Posters? Why do I have to post labor law posters? This is a popular question regarding labor law posting requirements. The simple answer is: Because you’re mandated by law to post them. This applies to all businesses with employees on payroll, unless the employee is your spouse. How can I find out which posters need to be displayed in my workplace? You can learn which posters are required for your business by using our free Poster Advisor Tool. After answering a few simple questions, you’ll find out your employer posting requirements instantly. Where should I post the labor law posters? What if I have two break rooms? Do I have to display the posters in both areas? The best way to answer this question is by asking another question. Do all your employees have access to both rooms? If the answer is no, then it is suggested that you display the labor law posters in both break rooms. If yes, then you should be compliant with the posters in one break room. If my employees work on separate floors of the same building, do I need to display the compliance posters on each floor? Yes, you need to post the compliance posters on each floor because you’re required to post the labor law posters where your employees can readily see them. The key word here is access. Your employees must have easy access to the labor law posters. 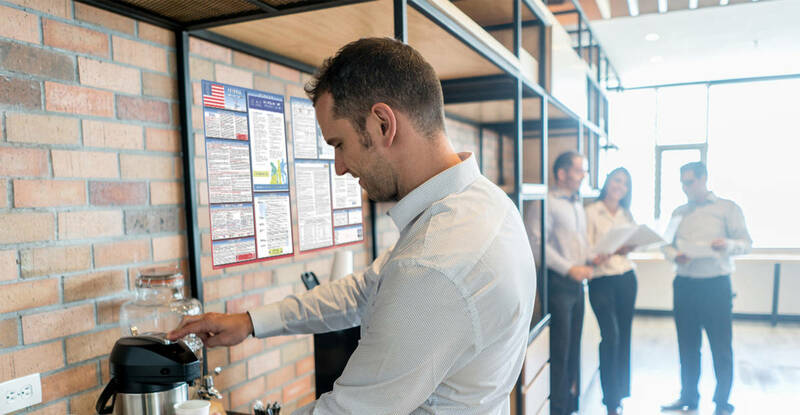 If employees are required to travel or go out of their way to read the posters, then the posters are not easily available to them, and as an employer you are not following the labor law compliance requirements. Some of my employees work in a separate building. Do I need to display the posters there? Yes, you should display the compliance posters in both buildings so that all employees have easy access to the posters. What should I do about my employees who work remotely? There are products specifically geared for these types of employees. Poster Compliance Center’s Virtual Compliance Guide allows employees to view the labor law notices from their computer or mobile device. While this is not a substitute for the labor law posters—you are still required to display the actual posters—the Virtual Compliance Guide can serve as a great resource for employees who don’t have regular access to the posters. Hopefully we’ve answered your posting requirement questions. Please leave us a comment or question if there’s anything else you would like to know! You can also check out our Labor Law Updates page to find out if you need new labor posters! Want more updates and information about labor laws? Find us on Twitter, LinkedIn, and Facebook.